The Eastern Conference-leading Toronto Raptors upstaged NBA champions the Golden State Warriors 113-93 on the road. Toronto were a class above even without Kawhi Leonard on Wednesday as they completed their regular-season sweep of the Warriors, having topped Golden State last month. The Raptors amassed a 16-point lead by half-time, and they never looked back at Oracle Arena, where they won for the first time in 14 years. 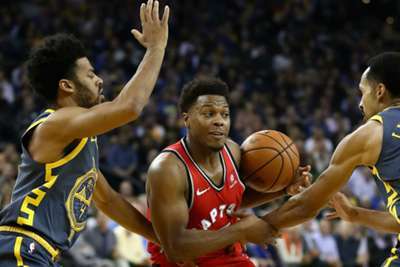 Kyle Lowry, who has faced criticism for his performance against the NBA's best teams lately, showed up against the Warriors with 23 points, 12 assists and three steals. Serge Ibaka was just behind Lowry in scoring, tallying 20 points on seven-of-16 shooting. Anthony Davis scored 44 points on 16-of-32 shooting and grabbed 18 rebounds in the New Orleans Pelicans' 118-114 win over the Oklahoma City Thunder. CJ McCollum recorded 40 of the Portland Trail Blazers' 83 points in their 92-83 loss to the Memphis Grizzlies. John Wall posted 34 points on 14-of-26 shooting and had 13 assists in the Washington Wizards' 130-125 overtime loss to the Boston Celtics. Spencer Dinwiddie had a career-high 39 points in the Brooklyn Nets' 127-124 upset win at the Philadelphia 76ers. Alec Burks scored one point on 0-of-six shooting in the Cleveland Cavaliers' 113-106 victory against the New York Knicks. Jeremy Lamb sealed the deal for the Charlotte Hornets with this game winner in a 108-107 victory over the Detroit Pistons. James Harden and Chris Paul were both great the last time these two teams met, resulting in a Houston Rockets win. However, the Los Angeles Lakers are a much different team this time around. After winning seven of their last 10 games, Los Angeles are in fifth in the Western Conference. Houston ended a three-game losing streak on Tuesday when a line-up change gave them new life against the Trail Blazers.